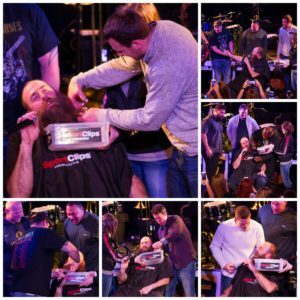 Former Steelers defensive end Brett Keisel on Monday allowed his famously overgrown beard to be snipped away, chunk by chunk, by his celebrity friends and former teammates in the name of charity. “It’s amazing to me to see all my friends and people coming out to support such a strange event, but an event that really means a lot to me and to a lot of kids around here,” said Keisel, 38, who played with the Steelers from 2002 to 2014 and continues to make Pittsburgh his home. “Shear Da Beard,” held on Monday night at Jergel’s Rhythm Grill in Warrendale, benefits the Division of Hematology/Oncology at Children’s Hospital of Pittsburgh of UPMC. With the money raised Monday night, organizers expected the total raised since the first event in 2011 to top $300,000. Fans, many dressed in Steelers jerseys, were lined up prior to the doors opening at 6 p.m., and by 6:30 the crowd was quickly filling in the space in front of the stage. The event started shortly after 7 p.m. Keisel was joined on stage by friends including: WWE Hall of Famer Shawn Michaels; former teammates James Harrison, Heath Miller, David DeCastro, Chris Hoke and Cam Heyward; defensive line coach John Mitchell; head coach Mike Tomlin; and the Penguins’ HBK line of Carl Hagelin, Nick Bonino and Phil Kessel. 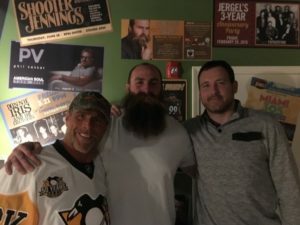 Miller’s presence was unexpected for Keisel, who said his little daughter came to him at home earlier in the day and said they had a surprise for him. Michaels, a three-time world wrestling champion, and Keisel became friends during the Penguins’ playoff run last season, during which time Michaels said he was overwhelmed by the city’s fans. Coming back to town for the event wasn’t much of a negotiation. “(Keisel) asked, I said yes,” Michaels said. Also joining Keisel on stage early in the evening were two young cancer patients, 6-year-old Jimmy and 15-year-old Sean. 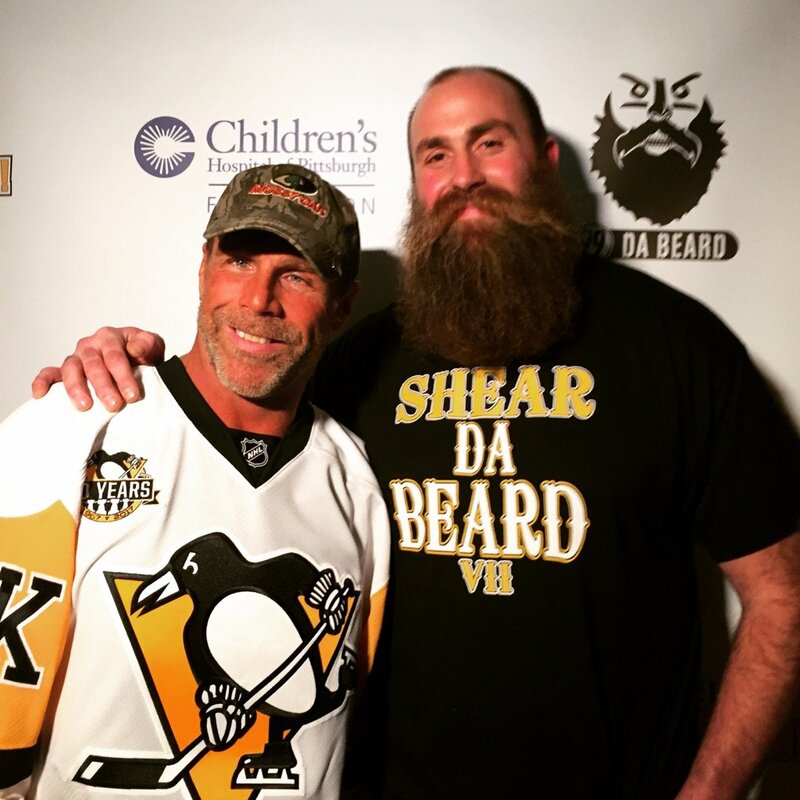 A who’s-who of Pittsburgh legends were on hand Monday night to help shave what may be Pittsburgh’s most famous beard. t was difficult to identify the highlight of the night; it can be that way when Brett Keisel, James Harrison, Mike Tomlin, Carl Hagelin, Nick Bonino, Phil Kessel, Donnie Iris and Shawn Michaels, among others, are sharing the same stage. But what resonated was unmistakable: Pittsburgh really is someplace special. Why else would Keisel, a native of Greybull, Wyo., not only embrace Pittsburgh as his adopted home but also enthusiastically recruit other potential converts? It goes beyond the 12 seasons Keisel spent playing for the Steelers, a run that included the Steelers appearing in three Super Bowls and winning two Lombardi trophies It goes beyond Keisel’s commitment to Children’s Hospital of Pittsburgh of UPMC, a cause for which he has long been a champion. Keisel has been an ex-Steeler for two seasons. Read all of the above articles, and more HERE.